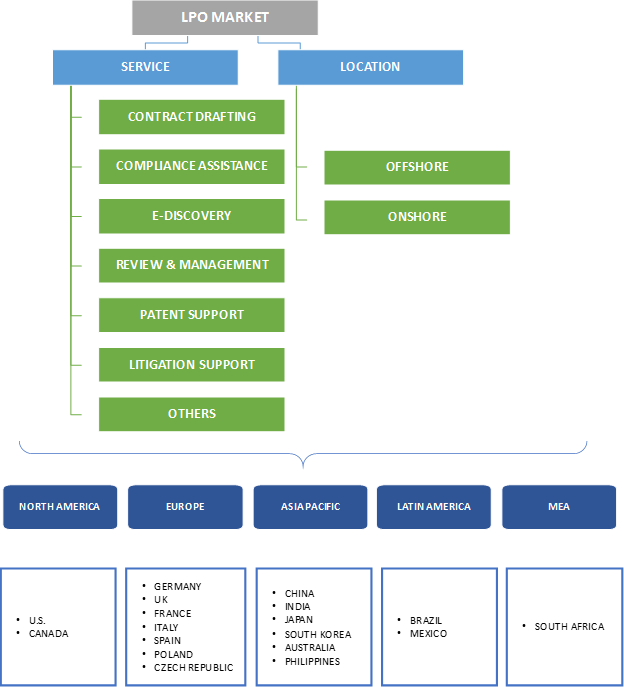 (LPO) Legal Process Outsourcing Market size exceeded USD 3 billion in 2016 with over 35% CAGR estimation from 2017 to 2024. The LPO market size has gained significance in large enterprises, which have their own inhouse counsel and legal departments and is not only limited to law firms. These companies are seeking opportunities to secure their back-end services to provision their internal operations. This is a remarkable shift in the legal process outsourcing market, and determines how essential it is for organizations to evaluate their business processes, and recognize areas they need to outsource operations to confirm costs are minimized and process efficiencies are maximized. Security concerns and breech of ethical codes are the major challenges which will hinder the LPO market growth. This is due to the concern of the companies regarding the transfer of confidential information while sending it to the providers. Furthermore, the hazards associated with the illegal practice of law has made various consumers uncomfortable about using LPO providers. The e-discovery services market will grow significantly over the forecast timeline due to the rising demand from law firms to outsource activities which are less in value, in order to target tasks such as delivering tactical legal advice. Organizations are more inclined towards managing core responsibilities, and outsource transactional operations that do not necessitate high degree of expert knowledge. Patent support service segment is anticipated to witness growing demand in the legal process outsourcing market due to the need to outsource qualitative tasks, such as IP litigation and proof-reading, which aids large organizations by releasing up their employees from such tedious tasks so that they can concentrate on high-value tasks. 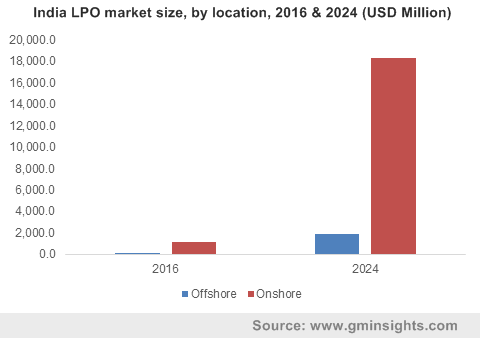 The offshore LPO market will witness growth owing to the need to outsource legal activities to countries such as India, Philippines, and South Africa. This outsourcing is done due to the presence of large number of efficient lawyers whose pay scales are much lower than the ones in countries such as the U.S.
Industry participants in legal process outsourcing (LPO) market include Integreon, Inc., UnitedLex Corporation, Elevate Services Inc., Pangea3 LLC, Axiom Law, etc. The players are focusing on offering higher-value services such as supporting compliance management. They are expanding their offerings beyond litigation and regulatory investigation support services to contract management to offer varied services to their customers. In addition, these industry participants concentrate on process, people and geographic capability and strategic alliances to gain prominence. Several players are participating in frequent mergers and acquisitions and expanding their service offerings. The high cost associated with the carrying out of legal tasks is the prime factor propelling the legal process outsourcing market growth. Security concerns regarding the transfer of the information to the providers may inhibit the industry growth. The organizations are considering the risks associated with the transfer of information to offshore companies. The service providers are delivering personalized and flexible costs based on the size and type of legal engagement.